Ian McEwan never fails to impress me. In all of his work that I've read to-date, he has been indefatigable in his pursuit of perfect, beautiful and dangerous metaphors. He dives into the depths of the human psyche and consistently resurfaces each time with these wonderful mysterious black pearls of truth. And it is with scientific accuracy that McEwan polishes these pearls. impressive to behold but something of a virtuous pain to read. I haven't had the opportunity to read that particular work, but based on what I do know of McEwan (and especially with the new addition of Enduring Love to my experience) I don't necessarily agree with that statement (again, haven't read Solar yet) but I can appreciate that view of McEwan on the whole. His works are naturalistic and sometimes his beautiful prose can give way to phrasing that borders on scientific formula. But this, I love about McEwan. It gives him a post modern quality without making him necessarily a post modern author. 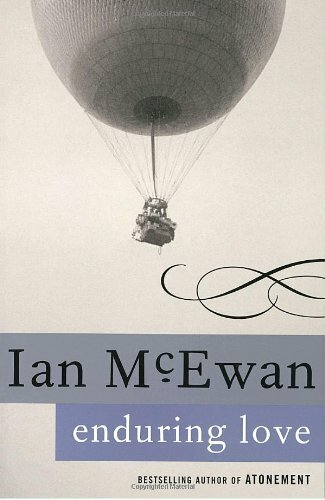 And because of this, when his story suddenly shifts from naturalism to a beautiful and sometimes terrible romanticism, the reader is shocked; the quadratic equation has just been altered, as if McEwan is re-defining algebra and geometry in every story, in a different way. In Enduring Love (which I was turned on to by a passage in The Age of Wonder), our narrator can trace the change in his life to the exact millisecond at the beginning of the book. I relate this somewhat to an episode of "Lois & Clark" (Season 4, Episode 15: "Lois and Clarks") in which Lois and H.G. Wells (I know, I know) must know and locate the exact second in which Clark disappeared through the Time Window, and into "Eternity" (don't worry, they do.) And on this moment, we base our trust in him (Joe Rose, the narrator of Enduring Love, not Clark Kent). As long as he and we can reconnect to that moment, our trust can remain in tact. As the story goes on we jump from moment to moment with him, following him as undegrad students follow their professors through the complex calculations of sine, co sine and tangent. And when finally he misses a step, when it seems he's got the answer but cannot show the work, it is then that we begin to doubt the reliability of our narrator. We begin to conceive that perhaps he's had a calculator under the table this entire time, that perhaps the sum of the variables is not what we thought it to be. And then, just when we're about to walk out on the professor (by the way, this character is not a professor, but a scientific journalist who has made a long career of giving the answers without showing the work), the equations and calculations seem to slip off of his lectern of their own volition, floating to the ground on loose leaf, the other shoe dropping. This is coincidence, this is fate, luck, chance...math and science can not compute this magical revelation in which the madman gives himself away and our narrator is vindicated. This is where the McEwan genius lies. I almost didn't expect it. I almost resigned myself to an ending like Rivka Galchen's Atmospheric Disturbances which had been more than disappointing. But McEwan came through for me in the end, not with a wholly happy ending (it wouldn't make sense if it were) but with a very satisfying ending just a few degrees away, parallel to the line you expected. There is a film adaptation of this book from 2004 by the same title. I would avoid it because it's not great, but you CAN watch it instantly on Netflix, and Samantha Morton and Bill Nighy are in it as well as Daniel Craig.